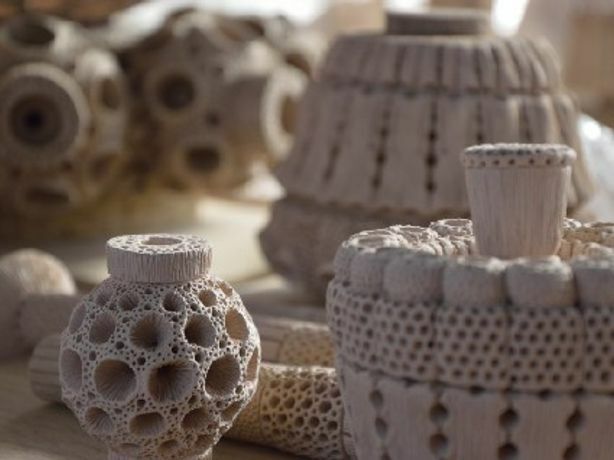 Alexis Rago's exquisite ceramic sculptures are elaborate constructions that push the technical boundries of ceramics in breathtakingly delicate detail. He references ideas from life science, evolution, anthropology and sacred art, then leaves it open to the viewer to decide what the work might be - perhaps fantastic artificial fossils, ivory carvings and ritualistic objects. In Chaos Contained, a new exhibition produced for the National Centre for Craft and Design Alexis has produced an intriguing multi-sensory experience. The exhibition features brand new large scale ceramic works integrated with other media, such as digital sound and projected imagery. Alexis will be giving a free talk at the gallery on Saturday 21 June between 1pm and 2pm. Chaos Contained is a touring exhibition from the National Centre for Craft and Design, Sleaford.